The government of Afghanistan lost almost 15 percent of its territory last year, as Taliban insurgents continued to launch attacks amid declines in U.S. and allied military personnel. The figure is included in a government watchdog's latest assessment of the security situation and reconstruction effort in Afghanistan. The assessment comes as the Donald Trump administration grapples with how to move forward in what has become America's longest war. "Analysis of the most recent data provided by U.S. Forces in Afghanistan (USFOR-A) suggests that the security situation in Afghanistan has not improved this quarter," states the latest quarterly report from the Special Inspector General for Afghanistan Reconstruction, or SIGAR. "The numbers of the Afghan security forces are decreasing, while both casualties and the number of districts under insurgent control or influence are increasing." The government of Afghanistan lost control of 15 percent of its districts between Nov. 2015 and Nov. 2016, according to figures from the Pentagon. Roughly 57 percent of Afghanistan's 407 districts were under control or "influence" of the Afghan government as of mid-November, a 6 percent decrease from August and a 15 percent decrease from November 2015. Meanwhile, the number of districts under the control or influence of insurgents increased from 8 to 10 percent since August, with roughly one-third of all districts deemed "contested" by insurgents. The report offers a bleak assessment of the security situation in Afghanistan, which remains unstable despite billions of dollars invested by the U.S. government. President Obama was forced to slow the drawdown of U.S. troops from Afghanistan last year, leaving about 8,400 U.S. forces in the country through his final term to advise, train, and assist local forces fighting the Taliban. 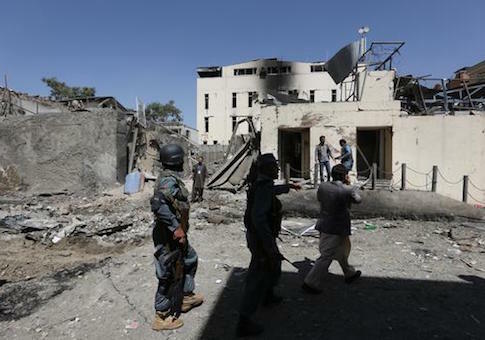 Insurgents have continued to attack key population centers and security checkpoints, challenging Afghan army and police forces that have made slow gains despite high casualties. The overall troop strength of the Afghan national army has declined for three consecutive quarters, according to SIGAR, losing more than 1,100 personnel between August and November. The count of Afghan national police forces also shrunk by 845 during the latest reporting period. Afghan forces endured over 18,500 casualties last year, according to figures from the Afghan government. This month, the Defense Department deployed about 300 Marines to southern Helmand Province, the site of some of the heaviest fighting during combat operations in Afghanistan. The Marines were deployed to aid Afghan forces there. Afghanistan's Uruzgan and Helmand provinces have the largest percentage of districts controlled or influenced by insurgents. U.S. military personnel have offered tempered praise of Afghan forces, highlighting their ability to defend areas and retake territory temporarily lost to the Taliban. At the same time, officials have expressed concerns about the Afghan forces' high casualty rates and persisting capability gaps. Gen. Joseph Dunford, the Joint Chiefs of Staff chairman, and Gen. John Nicholson, the commander of U.S. and NATO troops in Afghanistan, described the enduring conflict as a "stalemate" last September. It is unclear how the new administration will respond to problems in Afghanistan. The Wall Street Journal reported last week that Trump told Afghan President Ashraf Ghani on a phone call in December that he would consider increasing U.S. troops in the war-torn country. At the same time, Trump has promised to end "nation building" and focus on domestic issues. Last week, Trump issued executive actions directing a readiness review of the U.S. armed forces and the development of a strategy to defeat the Islamic State in Iraq and Syria. Trump and Defense Secretary Jim Mattis have pledged to rebuild the U.S. armed forces and roll back budget reductions that have squeezed defense spending in recent years.